Washington(PTI) : In a stern message to Pakistan, India and the US today asked it to ensure that its soil is not used for cross-border terror with Prime Minister Narendra Modi and President Donald Trump vowing to boost their fight against terror groups like ISIS, JeM, LeT and D-Company. As the two leaders held their maiden meeting at the White House and displayed a lot of chemistry, the two countries also called on Pakistan to “expeditiously” bring to justice the perpetrators of the Mumbai, Pathankot attacks and other cross-border terrorist assaults by Pakistan-based groups. Modi and Trump vowed to strengthen efforts to fight terrorism and eliminate safe havens for terrorists. 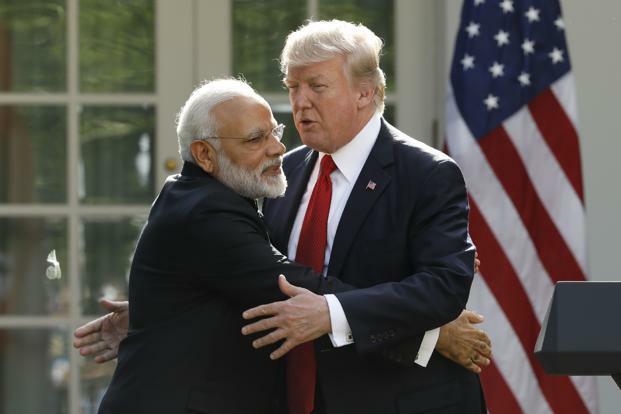 “Eliminating terrorism is among the top-most priorities for us,” Modi told reporters in his joint press statement with Trump at the White House Rose Garden. Ahead of the meeting, the US State Department had set the tone for the summit by declaring Syed Salahuddin, chief of Kashmiri militant group Hizbul Mujahideen, as a ‘global terrorist’. The State Department’s action sent out a strong message against the terrorism emanating from Pakistan which is hurting India. During the meeting, that was high on symbolism, there was no mention of contentious issues like the H-1B visa reform and climate change. The Trump administration also confirmed that it had given its approval to the multi-million dollar sale of a transport carrier to India, along with a separate purchase of around 20 Guardian drones. “I would say the relationship between India and the United States has never been stronger, has never been better,” Trump told Modi as they made press statements. Modi highlighted his government’s economic reforms and the ease of doing business in the country. “We consider the United States as our primary partner in India’s socio-economic transformation in all our flagship programs and schemes,” Modi said. “I’m sure that convergence between my vision for a new India and President Trump’s vision for ‘Making America Great Again’ will add a new dimension to our cooperation,” Modi said, in reference to Trump’s signature campaign slogan. The meeting, however, seemed to be dominated by the discussions on cross-border terrorism with the leaders announcing increased cooperation to prevent terrorist travel and to disrupt global recruitment efforts by expanding intelligence-sharing and operational-level counter-terrorism cooperation. The leaders also affirmed their support for a UN Comprehensive Convention on International Terrorism that will advance and strengthen the framework for global cooperation and reinforce the message that no cause or grievance justifies terrorism, the joint statement said. Trump said both nations are “determined” to destroy terrorist organisations and the radical ideology that drives them. “The security partnership between the US and India is incredibly important. Both our nations have been struck by the evils of terrorism and we are both determined to destroy terrorist organisations and the radical ideology that drives them. We will destroy radical Islamic terrorism,” he said. Foreign Secretary S Jaishankar, while briefing reporters on the meeting, said the two nations noted that in their joint statement that terrorism is a global scourge that must be fought in every part of the world, and the US and India would do it together. “Our militaries are working every day to enhance cooperation between our military forces, and next month they will join together with the Japanese navy to take part in the largest maritime exercise ever conducted in the Indian Ocean,” Trump said. In their address at the White House Rose Garden, the two leaders also touched on trade, security, bilateral co- operation and instability in Afghanistan, among other issues. Modi termed his talks with Trump as an “important page in the history of India-US relationship”. He said he discussed in detail with Trump defence and security cooperation between the two nations. The two leaders had spoken over phone thrice before this meeting. Describing both countries as “global engines of growth”, the prime minister said trade, commerce and investment are key areas of mutual cooperation. “Technology, innovation and knowledge economy are also areas we are actively looking at,” he said. Trump said he is keen to work with Modi on creating a “fair and reciprocal” trade relationship between the two nations and called for the removal of “barriers” for the export of US goods into Indian markets. “It is important that that we reduce our trade deficit with your country,” he added. The US president said that ties between India and the US have never been stronger and better. Before their meeting began, he thanked India for ordering military equipment from the US. Trump said he was pleased with an order by an Indian airline company for 100 new American planes, calling it one of the largest orders of it is kind, which will support thousands and thousands of American jobs. “We’re also looking forward to exporting more American energy to India as your economy grows, including major long- term contracts to purchase American natural gas, which are right now being negotiated, and we will sign them. Trying to get the price up a little bit,” he said. Referring to the GST reform to be implemented across India starting next month, Trump said it was “the largest tax overhaul in your country’s history”. “We’re doing that also, by the way. Creating great new opportunities for your citizens. You have a big vision for improving infrastructure, and you are fighting government corruption, which is always a grave threat to democracy,” he said. Both leaders also expressed concern over rising instability in Afghanistan caused by terrorism, and agreed to continue strengthening coordination for ensuring peace and stability in the war-torn country. “The North Korean regime is causing tremendous problems and is something that has to be dealt with, and probably dealt with rapidly,” Trump said. Vice President Mike Pence, who accompanied the President in most of his meetings with Modi at the White House, tweeted, “Privilege for @POTUS & me to meet PM of India @narendramodi at @WhiteHouse.” “As President Trump said our two nations are tied together in friendship,” he said.